Balance, it seems, is somewhat of an illusive character. 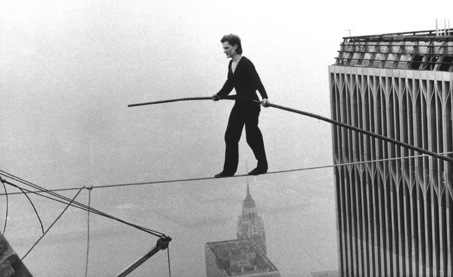 Not in terms of being able to stand up straight or be like Philippe Petit (photo below). No, life balance, work and play, are in a constant act of balancing with work playing the role of the ten ton weight. The age old saying, ” All work and no play makes Jack a dull boy” rings painfully true. If I’m not at my day job, which often over runs the constraints of the 9-5 (not that I’m complaining in the slightest!) I’m working on another of my harebrained schemes. I feel that I may well be one chemical spill away from opening a laboratory and concocting evil plans to kill Superman. Insanity lingers in my morning coffee. My dreams have become flooded with work related nuggets: press releases, Christmas cards and ringing phones. I’ve not yet been chased by a rogue Christmas card but I feel a missed time chunk of cheese in the evening and I might well be fleeing from it across a field. London is of course not aiding my sorry slide in madness; the underground really seems to test my sanity on a daily basis. Some of the nuggets of bonkersness are: being stuck in an entire carriage rammed with vampires at Halloween (should note that vampires don’t exist, they aren’t real people, move on), a 70 year old man swinging on the handles of the tube singing “I’m the king of the swingers” at about the third rendition the woman sat next to me lent over and muttered, “he does this everyday” and finally a man dressed as Batman at 3pm on a Wednesday, enough said. So why has my December kicked off my mumbling grumblings? I could blame it on the winter blues, the never ending noise of London or the long work hours. That would be a lie though, it’s that balance I spoke of. The work to play ratio is clearly not equal, making me feel lopsided (not physical, I’m not up a bell tower, yet). My evening entrapments usually revolve around working or melting whatever still exists of my brain in front of the telly box. Escapism is king. You can now probably understand why I haven’t blogged in what seems like eons simply because my imagination has been stifled. Held captive by the mundane and the routine. Nothing has sparked my imagination ‘fire’ (not an imaginary fire, I’m not seeing piles of wood and kindling everywhere). So how have I cured this? I was going to lie to you and tell you I have been dabbling in booze and drugs but I’m not even slightly rock and or roll. In truth, my remedy was simply finding somewhere for me to think, to mull over ideas and to observe. 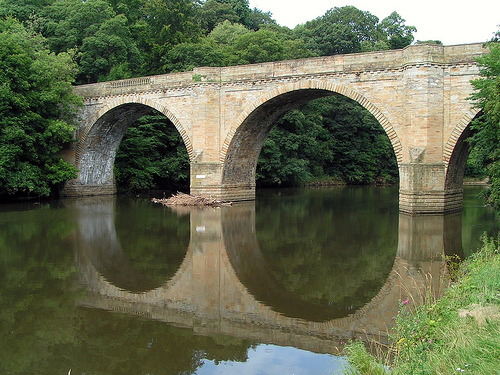 In Durham it was a bridge over looking the stunning Cathedral and in India I would sit on the rooftops and watch the streets below. London’s solution, however, is less glamorous but incredibly effective: the tube. The place full of drunks, bright lights and indescribable smells shouldn’t work. The abundance of things that shouldn’t inspire does the exact opposite. I sit on the tube for hours and scribble away furiously. Crazy? Of course. But when has anything I’ve ever done made sense? So I’m back and at full capacity firing on all metaphorical cylinders. Right, must dash, this is my stop. Very good. I like the ending. Funny way to end a piece that is slightly darker than the norm. Most good my lovely cousin keep it up. I do hope you have an Oyster card or your inspiration could get a bit expensive although I guess you could say that of Holmes with the lack of an Oyster card and a liberal dose of opiates. Excuse the rambling it’s been a long day. aw cousin of mine, get some sleep your ramblings sounds sleep deprived! I do have an oyster card with a monthly travel pass so I can travel till my heart’s content! I didn’t quite realise it was dark until you mentioned it, I’ll have to make sure I’m more “light” next post! Plus you need to get writing again, if I can so can you! Looking forward to Christmas Day? Love blogging and writing? Join us today. The equilibrium is a challenge. Especially on the between the cliffs. None secures measure. It’s very dangerous. maybe its crazy, and maybe it doesnt make sense, to others, but if it inspires you then who cares?! 🙂 Plus its true if one thing in your room is missing you wouldnt notice but if everything is missing all you can do is notice.